The demand of paper bags has been increasing day by day. 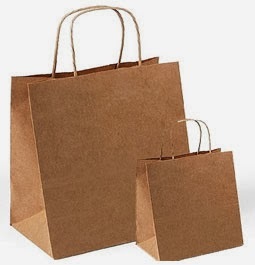 Paper bags are used in shopping malls, various shops. With this Automatic Paper Bag Making Machine, you can make upto 42” size paper bags. At first you have to buy paper role from the market. It is available in cheap price in the market of Rajabazar and Baithakkhana market in Kolkata. The price is approximately Rs.25 to Rs. 30 per kg. The price may vary on the quality of the paper. Now put the paper on the indicated place of the machine and set the size of the bags you want. The start the machine and paper bags will be made automatically. With this Paper Bag Making Machine you can make upto 150 bags per hour. The price of the Paper Bag Making Machine including motor is approximately Rs. 14 lakh. You can find many companies manufacturing a wide range of Paper Bag Making Machine. Their machine matches high technology electronic control.